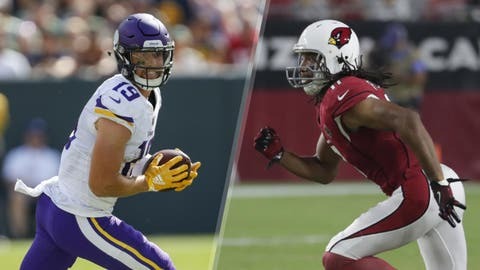 MINNEAPOLIS — Adam Thielen wasn’t even in high school yet when Larry Fitzgerald entered the NFL in 2004 with Arizona with the acclaim of the third overall pick in the draft. STREAKS, STATS AND NOTES — Cardinals WR Larry Fitzgerald plays in hometown for sixth time in 15-year career, with average of 87.4 receiving yards per game but no touchdowns. … Cardinals QB Josh Rosen coming off first career NFL victory. … Cardinals RB David Johnson has combined 53 touches, 283 yards from scrimmage and two TDs in two career games vs. Vikings. … Cardinals DE Chandler Jones has 13 tackles, four tackles for loss, three sacks, one forced fumble and TD return of blocked FG in two career games vs. Vikings. … Backup QB Sam Bradford is one of six players on Cardinals who’ve spent time with Vikings. … Vikings QB Kirk Cousins is first player in NFL history to complete at least 30 passes in four straight games. … Vikings WR Adam Thielen leads league in receptions (47) and is second in yards (589). He’s also first in third-down catches (14). … Thielen is third player in NFL history with five 100-yard games to start season, joining Charley Hennigan (seven games for Houston Oilers in 1961) and Bob Boyd (five games for Los Angeles Rams in 1954). … Minnesota DE Danielle Hunter has a sack in each of first five games. … Despite slipping significantly in yards and points allowed after leading NFL in both categories last season, Vikings’ defense is third in league on third downs with 29.6 percent conversion rate (16 of 54). … Fantasy tip: Vikings aiming for return of RB Dalvin Cook, who has missed two of last three games to hamstring injury. Cardinals have allowed league-most eight rushing TDs.